The LG Gram lineup is the most lightweight laptop that won’t break your bank packs with the latest technology and pretty long battery life. The LG Gram 13” weighs only around 2.07 pounds or 939 grams offers a solid performance with a nice port selection and fingerprint sensor. 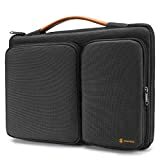 The LG Gram is pretty great on its own, however, by pairing with the right accessories, you can be more productive, have extra storage space, and protect your laptop from any accidents. Without further ado, here are the best LG Gram 13” Accessories that will improve your experience much better. Protect your laptop screen and your eye. Designed to fit LG Gram 13”. Protect your screen from scratches, fingerprint, and filter laptop screen radiation. Included a microfiber cloth, Squeegee, and dust removal sticker. Comes with 2 pieces of the screen protector. The LG Gram 13” has a pretty great display with FHD (1920 x 1080) touchscreen with thin bezels. To make sure that your screen stays clean and protected, you’ve better applying a screen protector. This PcProfessional screen protector is designed specifically for the LG Gram 13”. It comes with anti-glare, anti-fingerprint, and filters the screen radiation features which protect your screen and your eye. It’s also strong with the making of three layers of high-quality electrostatic material. On a single purchase, you will get 2 pieces of the screen protectors and a complete installation material set. The LG Gram 13” has a pretty nice I/O ports selection as it has a single USB C and two full-sized USB 3.0 port for connecting every USB devices you want. However, it still lacks some ports that you will need if you are a student, corporate staff, or a photographer. 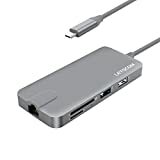 If you want an adapter that is light and takes care of all connectivities, this Letscom 8-in-1 Type-C hub is an excellent choice. This single adapter has a Gigabit Ethernet, a USB-C charging port, 2 USB 3.0 ports, a USB 2.0 port, a 4K HDMI port, an SD slot, and a TF card slot. It made from a slim and sleek aluminum. Easy and inexpensive way to expand your laptop’s storage. High transfer speeds of up to 90MB/s. Capable of recording video in 1080p. The LG Gram comes with a standard micro SD card slot allows you to insert any microSD card formats including microSD, microSDHC, and microSDXC. By adding a microSD card you can expand more storage on your LG Gram laptop for data backup and transfer. This Sandisk MicroSD features a class 10 speed rating as it can support faster data transfer speed up to 90MB/s. This MicroSD card also has a great protection with waterproof, temperature proof, shockproof, X-ray proof and magnet proof. Has enough room for LG Gram 13”. If you want a perfect protection with a minimalistic design and having enough space for your accessories, this Tomtoc sleeve briefcase will be the best choice for you. It features the CornerArmor™ Patent which is excellent in protecting your laptop from any accidents. 8x DVD and 24x CD Write Speed. Supports DVD+R/RW, DVD-R/RW, and DVD-RAM. Supports all Windows version since Windows XP and macOS. Available in 4 colors – black, gold, silver, and white. The disc drive was frequently used for data backup, media consumption, and OS installation. Nowadays, most laptops are no longer include an internal disc drive anymore. If you still need to work on the compact disc or DVD, having a portable DVD Burner is a great idea. This LG external DVD writer is a slim and lightweight portable DVD burner shared available in many colors including black, gold, silver, and white. It can be connected to your LG Gram 13” laptop via a USB port and compatible with a wide range of CD and DVD media. Do you want to play games on your LG Gram 13”? It’s obvious that you can’t play AAA games at high settings as it isn’t built for gaming, but most titles are still playable on low settings. Most games allow you to play with either keyboard and mouse or joystick. The Xbox Wireless Controller is designed to work seamlessly with Windows 10 PCs, Xbox One, tablets, and phones. It brings the best gaming experience with responsive thumbsticks, enhanced D-pad, impulse triggers, and included stereo headset jack. Protect your laptop’s keyboard as well as your laptop from spill, dirt, and dust with an ultrathin durable high-grade TPU. It’s easy to install and remove for cleaning. You might don’t want to use a bulky mouse with your LG Gram. The Surface Arc Mouse is extremely portable with an attractive design just like your LG Gram laptop. You might sometimes need a bigger screen for multitasking. The LG UltraWide IPS monitor offer a beautiful Full HD 2560 x 1080 resolution and many more features including FreeSync, Screen Split 2.0 and Game Mode. You might need a portable keyboard when you want to connect and work on a larger external monitor. The Logitech K380 is the best Bluetooth keyboard in term of connectivity, responsiveness, and comfortability. This patented designed mStand by Rain Design raises your LG Gram screen height to eye level for better ergonomics while you connecting to external displays, keyboard, and mouse. If you don't have an account on our forums, you can use this comments section to share your issues, solutions, or any ideas related to the “Best LG Gram 13” Accessories for 2019” topic.